Not too long ago I finished watching “The real housewives of Melbourne“. Some parts were a little superficial and there was a bit of cattiness in it, but sometimes I just have the mood to just let go and watch a bit of “trash”!! 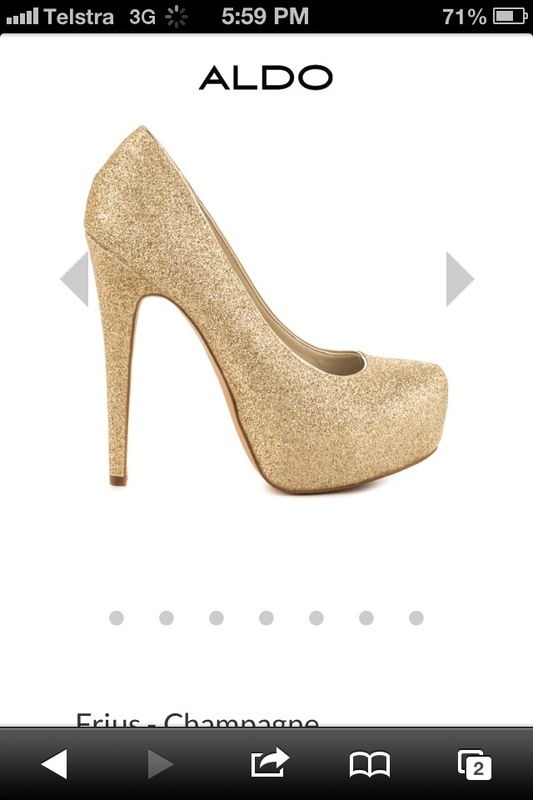 I have been needing some shoes that scream “sparkle”!!! 1. Gina Silver – Can also be Rose Gold which is embellished in crystals and is 5 inches high!!! 3. Aldo Frius Champagne $80 – These Aldo shoes are a party goer! The sparkle in them will be the disco light of the night!!! 5. Pink INC Sinner – $99.95 Sleek and GOLD metallic pointed toes. The ICONIC brings out more on SALE. 6. CHARLOTTE OLYMPIA FORZIERI Monroe Rose Gold Metallic Leather Pump $417- I love the name of this shoe because there are two princesses with those names!! It’s a favourite colour and is plain but shimmery at the same time. Very nice for a special occasion. What a girl wears as a shoe can say a lot about her personality. If you’re not the “sparkle” type then try Diana Ferrari – Lorikeet Black for $139.95 or some Boden New British Cicely Heel for $168.38, a comfortable high heel that would be great for work or going out! Boden New British is a brand I just discovered, check out their DRESS collection. You will love what is NEW in and some online exclusives. When was the last time you went shoe shopping?